Dawn Nettles has a job interview Friday, but she figures the odds are against her. "They're not going to hire me," the 54-year-old Garland woman said. "They hate me with a passion." "They" refers to the Texas Lottery Commission and Gtech Corp., the company that operates the lottery for the state. The commission is seeking an executive director to replace Reagan Greer, who resigned in July after admitting he had signed off on advertising inflated jackpots. Ms. Nettles says she's the one who brought the discrepancy to light. "The Lottery Commission is in a lot of trouble," she said. "Just hiring me would give them credibility." Demure she isn't. What she is, there are a lot of opinions about. To some, she is an independent lottery expert, a watchdog who looks out for the players' interests. To others she is a nuisance, a nitpicking critic who is impossible to please. Lottery Commission spokesman Bobby Heith says Ms. Nettles is a serious candidate for the job, one of only eight of the more than 110 applicants to get this far. "I guess you could consider her a critic, but she has been helpful with some of her criticism," Mr. Heith said. "She calls things to our attention." Like minor errors on the commission's Web site. And that letter she wrote to the attorney general in June about the inflated jackpot estimates. "It's something we discovered first. But her letter brought media attention to the situation," Mr. Heith said. "The resignation of Executive Director Greer followed about a month after that. That was one of the things going on at that time. Whether it was a direct cause, I'm not sure." State Rep. Ismael "Kino" Flores, D-Mission, chairman of the House committee that oversees the Lottery Commission, said Ms. Nettles has a "full understanding of the operations of the lottery" and should be a serious candidate for the job. "A lot of people think her role has been negative, but I don't, because a lot of the things she has said have proven true," Mr. Flores said. Ms. Nettles and her husband, an airline pilot, have been married for 28 years. They have three daughters, five grandchildren and a yellow Lab named Shelby. Her husband used to race dirt bikes, and they still ride them for fun. She wanted to be her own boss, so she got into the publishing business with Unexaggerated Homes, a real estate magazine that she said set itself apart because there were no adjectives in it. It published from 1979 to 1993. Then she switched to Lotto Report, which she runs from her home, because she thought it would be easier. The report – a record of every winning number and combination of numbers in all the lottery's games – comes out every two weeks, electronically and in print. About 3,500 subscribers pay $19.75 for a six-month subscription or $37.50 for a year. Some – "die-hard players," she calls them – have been with her from the beginning. When the lottery first came to Texas, she was a big fan. "I voted for it," she said. "I was all for it. I love games of chance." But things started going downhill, as she sees it, in the late 1990s. She adamantly opposed the commission's decision to add balls to the game on the theory that greater odds would mean fewer winners, bigger jackpots and more sales. "They designed the game so nobody could win it," Ms. Nettles said. Now, she says, Pick 3 is the only commission game that's still a good play. And she picks her spots. "I don't play a lot," she said. "That's how come I'm ahead." She figures she's ahead at the game but probably not in the race for the boss's chair. "Gtech would fear my being there," she said. "I'm banned from Gtech." She said she fell out with the international gaming company that runs the lottery for the state when she questioned the legitimacy of a customer survey and company officials denied her request for a tour of their facility. Robert Vincent, Gtech's vice president for corporate communications, has a different take. "From what I'm told by our representatives in Texas, she sought access to secure areas that are off-limits to the public," Mr. Vincent said. "It was not specific to her. No one would have been allowed to go there." As for the chances of her becoming the new boss at the Lottery Commission? "We don't have an opinion about her one way or the other," Mr. Vincent said. "We don't take stands on who's going to be appointed to the commission. That's not our responsibility." 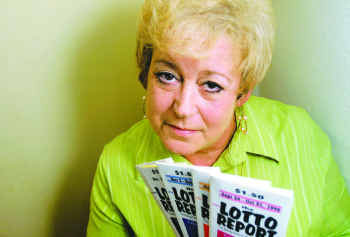 How would things be different at the lottery if Ms. Nettles gets the job? "I would analyze from the inside first," she said. She says retailers and players are dissatisfied, and she would address that to get sales up. "There would be fair games of chance and fair payouts," she said. "We would create winners. The more winners, the more they spend." She says, "If the state of Texas would like to restore trust and integrity, they will hire me in a second."